Though his music had slowly been gaining recognition in Prague during the early 1870s, Dvorák’s reputation and financial situation were still uncertain by the beginning of 1875. But in February of that year he was awarded the lucrative and prestigious Austrian State Prize for his third and fourth symphonies. Buoyed by this first sign of wider recognition he produced a stream of vital, strongly characterized works over the next twelve months, including the Serenade for strings, the opera Vanda, the fifth symphony and several chamber compositions. One of these was the Piano Quartet in D major, composed rapidly between 24 May and 10 June, shortly after the Piano Trio in B flat. Yet, like the trio, the piano quartet had to wait some years for its first performance; it was finally played, in a slightly revised version, in the Konvikt Hall, Prague, on 16 December 1880, at a concert supported by the city’s Artistic Circle. Dvorák’s music of this period is suffused with a highly personal and apparently spontaneous melodic freshness that had emerged only intermittently in his earlier works where Wagner’s influence had at times obscured the Czech composer’s natural lyricism. The wonderfully unfettered melodic invention, markedly Slavonic in flavour, of the fifth symphony and the string Serenade is shared by the Piano Quartet in D major, many of whose themes have the haunting simplicity of folk song. Yet the music also reveals the growing subtlety of Dvorák’s imagination. In the initial Allegro moderato, for example, the relaxed, syncopated opening theme almost immediately dips into B major, a magical key shift characteristic of Schubert; this is not only a beautiful effect in itself but also presages the importance of B major in the movement’s overall tonal scheme. Equally subtle is the way the second theme draws on two separate fragments heard earlier, transforming them into phrases of beguiling lyricism. Characteristically, Dvorák dwells at length on this idea, enhancing it with expressive counter-melodies. In the coda a splendid climax is forged from the grandioso combination of the two main themes. The Andantino is a set of variations on a grave melody in B minor, the choice of key surely influenced by the prominence of B major in the first movement. The five variations display an imaginative range of textures, from the sparseness of the first, through the gossamer delicacy of the third, in which the theme is inverted, to the full, rich colouring of the fourth, a free lyrical flowering that moves into the distant key of E flat. Dvorák draws an unexpected intensity from his theme in the coda, with its poignant chromatic harmonies and anguished final climax. Contrary to Dvorák’s usual practice in his chamber works there is no independent scherzo. Instead he ingeniously combines features of both scherzo and finale into a single movement. The scherzo element is represented by the initial waltz theme and a subsequent section in quicker tempo whose biting cross-rhythms evoke the furiant, a Czech dance that features frequently in Dvorák’s later music. These two sections alternate with an allegro agitato in common time whose smooth cantabile lines, distinctly Mendelssohnian in feeling, rather belie Dvorák’s tempo marking. The coda’s transformation of this expansive lyricism into a short-breathed jig has an almost comical incongruity. By the time Dvorák composed his Piano Quartet in E flat major he was an international celebrity, feted by the German and English musical establishments. The Berlin publisher, Simrock, who had made a fortune out of the first set of Slavonic Dances, had originally asked Dvorák for a new piano quartet in 1885, prompted, perhaps, by the success of Brahms’s work for the same instrumental combination. But it was not until four years later, after completing his opera The Jacobin, that Dvorák finally found the time to embark on the quartet. It was composed during July and August 1889, just before the eighth symphony, and the inspiration seems to have flowed easily: ‘The melodies just surged upon me’, he wrote to his friend Alois Göbl. Like the D major quartet it was premiered at a concert funded by the Prague Artistic Circle, on 23 November 1890. The Piano Quartet in E flat is a more complex and demanding work than the D major, its design more closely wrought, its scoring more original and inventive. Though the string-writing in the earlier work is masterly (Dvorák was an accomplished violinist and violist), the piano has a tendency to resort to stock figurations. 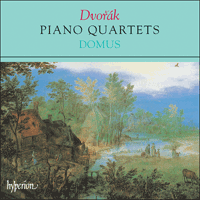 But by 1889 Dvorák was a vastly more experienced composer, and his writing for the keyboard in the E flat quartet is far more assured, with imaginative exploitation of both its percussiveness and its capacity for rich, massive sonorities. A particular feature of the string-writing is the prominence allotted to Dvorák’s own preferred instrument, the viola, especially in the fervent second subjects of the outer movements. The arresting opening of the Allegro con fuoco immediately elicits a skittish reply from the piano in a foreign key, B flat minor, suggesting from the outset both the movement’s rapid shifts of mood and its wide tonal scope. Dvorák draws an astonishing range of meaning from this opening paragraph, notably in its myriad rhythmic transformations in the development and its spectral appearance on tremolando violin and viola in the coda. The key structure of this Allegro is particularly subtle and cogent: the piano’s initial flirtation with B flat minor, for instance, has a weighty consequence when the recapitulation introduces the opening unison motif powerfully in that key, not in the expected E flat major; and the dissonant B natural which lends that opening motif such a distinctive flavour is the first hint of the importance of B major and minor both in the first movement (as, for example, in the B major recapitulation of the second subject) and in the work as a whole. For the Lento Dvorák moves into the key of G flat major, where the strings acquire a slightly veiled, dusky sonority. Formally the movement is as simple as the Allegro con fuoco was complex: five distinct melodies, of which the third and last are closely related, unfold at length and are then recapitulated, with altered scoring, in their original order. But expressively the music ranges wide, from the tranquil depth of the opening exchange between cello and piano to the powerfully scored fourth theme, whose passionate turbulence recalls the central section of the Adagio in Schubert’s String Quintet. In spirit the captivating third movement, with its deliciously airy textures, lies somewhere between a Ländler and a waltz. There is a whiff of gypsy melancholy about the second theme, in G minor, curling dolefully within a narrow compass; and, as Dvorák’s biographer John Clapham has pointed out, the third appearance of the main theme, in the piano’s highest register, evokes the cimbalom, an instrument characteristic of rustic Czech bands. In the central section, with its deft canonic writing, the whispering B major opening contrasts startlingly with the fortissimo continuation in B minor, where cross-rhythms lend added pungency to the music. There is once more a hint of the gypsy spirit at the start of the finale which, unusually in a major-key work, begins in E flat minor. Dvorák is typically lavish with his themes in the second group, which also includes a telling transformation of the opening theme, sounded dolce by cello and violin in imitation against an expressive viola counterpoint; while the soaring B major theme intoned by the viola in its haunting upper register is one of the composer’s loveliest inspirations. The exciting, tautly argued development concentrates almost exclusively on the opening idea, intensifying in turn its brusqueness and its latent lyricism. Malgré une lente reconnaissance de sa musique à Prague, au début des années 1870, Dvorák gardait une réputation et une situation financière précaires en février 1875, lorsqu’il se vit décerner le lucratif et prestigieux Prix de l’État autrichien pour ses troisième et quatrième symphonies. Revigoré par ce premier signe d’une plus large reconnaissance, il produisit, dans les douze mois qui suivirent, un torrent de pièces pleines d’entrain, au caractère fortement affirmé, dont la Sérénade pour cordes, l’opéra Vanda, la Symphonie no5 et plusieurs œuvres de chambre – parmi lesquelles figurait le Quatuor avec piano en ré majeur, qui fut composé rapidement, entre le 24 mai et le 10 juin, suivant de peu le Trio avec piano en si bémol. Ces deux pièces durent cependant attendre plusieurs années avant d’être créees et le quatuor avec piano fut finalement donné, dans une version légèrement révisée, le 16 décembre 1880, au Konvikt Hall de Prague, lors d’un concert financé par le Cercle artistique de la ville. La musique de Dvorák est alors baignée d’une fraîcheur mélodique extrêmement personnelle et apparemment spontanée, qui n’avait que sporadiquement affleuré dans ses œuvres antérieures, où l’influence wagnérienne avait parfois éclipsé son lyrisme inné de compositeur tchèque. L’invention mélodique merveilleusement débridée, à la saveur slave prononcée, de la Symphonie no5 et de la Sérénade pour cordes se retrouve dans le Quatuor avec piano en ré majeur, dont maints thèmes présentent la lancinante simplicité des chants populaires. Cette musique n’en révèle pas moins, aussi, la subtilité croissante de l’imagination de Dvorák. Ainsi dans l’Allegro moderato initial, où le thème d’ouverture détendu, syncopé, plonge presque tout de suite en si majeur, une transition tonale magique, toute schubertienne, qui, non contente d’être un effet magique en soi, présage l’importance de si majeur dans le schéma tonal global du mouvement. Tout aussi subtilement, le second thème repose sur deux fragments distincts entendus auparavant, qu’il métamorphose en phrases d’un lyrisme séduisant. Comme si souvent, Dvorák s’étend longuement sur cette idée, la rehaussant de contre-thèmes expressifs. Dans la coda, un splendide apogée naît de la combinaison grandioso des deux thèmes principaux. L’Andantino est une série de variations sur une mélodie austère en si mineur, un choix de tonalité assurément influencé par la prépondérance de si majeur dans le premier mouvement. Les cinq variations affichent un éventail de textures imaginatif, du caractère clairsemé de la première à la pleine et riche couleur de la quatrième – un libre épanouissement lyrique qui se meut dans la lointaine tonalité de mi bémol – en passant par la délicatesse arachnéenne de la troisième. Enfin, dans la coda, aux harmonies chromatiques poignantes et à l’apogée final angoissé, Dvorák tire du thème une densité inattendue. Au rebours de ce qu’il a l’habitude de faire dans ses œuvres de chambre, Dvorák n’intègre pas de scherzo indépendant, préférant ingénieusement combiner scherzo et finale en un seul et même mouvement. L’élément «scherzo» est représenté par le thème de valse initial et une section subséquente, dans un tempo accéléré, dont les contre-rythmes cinglants évoquent le furiant, cette danse tchèque qui sera si fréquente dans la musique de Dvorák. Ces deux sections alternent avec un allegro agitato, sis dans une mesure à quatre temps, dont les lignes cantabile régulières, au tempérament nettement mendelssohnien, contredisent plutôt l’indication de tempo de Dvorák. La transformation que la coda impose à ce lyrisme expansif, mué en une gigue haletante, est d’une incongruité quasi comique. Lorsqu’il composa son Quatuor avec piano en mi bémol majeur, Dvorák était une célébrité internationale, fêtée par les institutions musicales allemandes et anglaises. Encouragé, peut-être, par le succès du Quatuor avec piano de Brahms, l’éditeur allemand Simrock, qui avait fait fortune avec les Danses slaves, demanda à Dvorák de lui écrire un nouveau quatuor avec piano, en 1885. Mais ce ne fut que quatre ans plus tard, une fois son opéra Le Jacobin achevé, que le compositeur trouva enfin le temps d’honorer cette requête, exactement en juillet–août 1889 (juste avant la Symphonie no8). L’inspiration semble avoir coulé de source – «Les mélodies me sont juste venues», écrivit-il à son ami Aloïs Göbl – pour cette œuvre qui fut créée, là encore, lors d’un concert financé par le Cercle artistique de Prague, le 23 novembre 1890. Le Quatuor avec piano en mi bémol est davantage complexe et exigeant que son pendant en ré majeur – son plan est plus minutieusement ouvragé, son écriture plus originale et inventive. L’écriture des cordes du Quatuor en ré majeur a beau être magistrale (Dvorák était un violoniste et un altiste accompli), le piano, lui, tend à ne pas se départir des figurations courantes. Œuvre d’un compositeur bien plus expérimenté, le Quatuor en mi bémol affiche une écriture de clavier beaucoup plus assurée, qui exploite avec imagination la capacité de percussion de l’instrument, son aptitude aux riches sonorités massives. L’écriture des cordes se distingue par le primat accordé à l’instrument favori de Dvorák, l’alto, surtout dans les fervents seconds sujets des mouvements extrêmes. La saisissante ouverture de l’Allegro con fuoco arrache d’emblée une réponse espiègle au piano, dans une tonalité étrangère à l’harmonie, si bémol mineur, suggérant incontinent et les rapides changements d’atmosphère et la large étendue tonale du mouvement. Ce paragraphe d’ouverture est à l’origine d’une étonnante palette sémantique, notamment par ses myriades de transformations rythmiques (développement) et par son apparition spectrale dans la coda (violon et alto tremolando). Cet Allegro possède une structure tonale singulièrement subtile et pertinente: le flirt initial du piano avec si bémol mineur, par exemple, est lourd de conséquences lorsque la réexposition introduit puissamment le motif d’ouverture à l’unisson dans cette tonalité au lieu du mi bémol majeur attendu; et le dissonant si bécarre qui confère à ce motif initial une saveur particulière est le premier signe de l’importance que revêt si majeur/mineur dans le premier mouvement (ainsi, par exemple, la réexposition en si majeur du second sujet), comme dans l’ensemble de l’œuvre. Pour le Lento, Dvorák passe à la tonalité de sol bémol majeur, où les cordes acquièrent une sonorité légèrement voilée, crépusculaire. Ce mouvement est, dans sa forme, aussi simple que l’Allegro con fuoco était complexe: cinq mélodies distinctes – la troisième et la dernière sont étroitement apparentées – s’éploient longuement avant d’être réexposées dans leur ordre d’origine, mais avec une instrumentation modifiée. Cependant, sur le plan expressif, la musique voit grand, qui va de la paisible profondeur de l’échange initial entre le violoncelle et le piano au quatrième thème puissamment instrumenté, dont la turbulence passionnée rappelle la section centrale, de l’Adagio du Quintette à cordes de Schubert. L’esprit du captivant troisième mouvement, aux textures délicieusement éthérées, est à mi-chemin entre le Ländler et la valse. Une bouffée de mélancolie tzigane traverse le second thème, en sol mineur, qui se recroqueville tristement au creux d’un ambitus étroit; et, comme le fit remarquer John Clapham, le premier biographe de Dvorák, la troisième apparition du thème principal, dans le registre le plus aigu du piano, évoque le cymbalum, un instrument typique des orchestres campagnards tchèques. La section centrale, à l’écriture canonique habile, voit l’ouverture chuchotante en si majeur contraster de manière saissante avec le développement fortissimo en si mineur, où les contre-rythmes confèrent à la musique une causticité accrue. Une nouvelle allusion à l’âme tzigane survient au début du finale qui, chose exceptionnelle dans une œuvre en majeur, est en mi bémol mineur. Comme à son habitude, Dvorák se montre généreux avec les thèmes de son second groupe, lequel comprend aussi une révélatrice transformation du thème d’ouverture, énoncé dolce par le violoncelle et par le violon en imitation contre un expressif contrepoint à l’alto; quant au thème élancé, en si majeur, qui est entonné par l’alto dans son lancinant registre supérieur, il constitue l’une des plus charmantes inspirations du compositeur. Le développement passionnant, âprement défendu, se concentre presque exclusivement sur l’idée d’ouverture, dont il intensifie, à son tour, la brusquerie et le lyrisme latent. Zwar hatte seine Musik zu Beginn der 1870er-Jahre in Prag zunehmend Anerkennung gefunden, doch Dvoráks Ansehen und seine finanzielle Lage waren Anfang 1875 nach wie vor nicht gesichert. Im Februar des Jahres wurde ihm jedoch für seine dritte und vierte Sinfonie das lukrative und prestigeträchtige österreichische Staatsstipendium verliehen. Angespornt durch dieses erste Anzeichen allgemeinerer Anerkennung schuf er in den darauf folgenden zwölf Monaten ein bedeutendes charaktervolles Werk nach dem anderen, darunter die Streicherserenade, die Oper Vanda, die Fünfte Sinfonie und mehrere Kammermusikwerke. Eines davon war das Klavierquartett in D-Dur, das in kürzester Zeit zwischen dem 24. Mai und 10. Juni entstand, kurz nach dem Klaviertrio in B-Dur. Wie das Trio musste das Klavierquartett jedoch erst einmal mehrere Jahre auf seine Uraufführung warten; es wurde schließlich in einer leicht überarbeiteten Fassung am 16. Dezember 1880 im Prager Konvikt-Saal anlässlich eines vom Künstlerkreis der Stadt ausgerichteten Konzerts gespielt. Dvoráks Musik aus dieser Schaffensperiode ist von einer höchst persönlichen und offenkundig spontanen melodischen Frische durchdrungen. Diese war in seinen früheren Werken nur gelegentlich zu Tage getreten, wo Wagners Einfluss zeitweise den natürlichen Lyrismus des tschechischen Komponisten verdeckt hatte. Die wunderbar freimütigen, mit betont slawischen Anklängen versehenen melodischen Einfälle der Fünften Sinfonie und der Streicherserenade kennzeichnen auch das Klavierquartett in D-Dur, dessen Themen häufig die anrührende Schlichtheit von Volksliedern haben. Andererseits offenbart die Musik die wachsende Subtilität der Erfindungsgabe Dvoráks. Im einleitenden Allegro moderato zum Beispiel taucht das entspannte, synkopierte Eröffnungsthema nahezu unmittelbar nach H-Dur ab, ein zauberhafter Wechsel der Tonart, wie er für Schubert typisch ist; dies ist nicht nur ein hübscher Effekt, sondern auch eine Vorankündigung der Bedeutung, die H-Dur im übergreifenden Klangschema des Satzes zukommt. Gleichermaßen raffiniert ist die Art und Weise, wie das zweite Thema zwei verschiedene zuvor gehörte Fragmente aufgreift und sie in betörend lyrische Phrasen verwandelt. Wie es für ihn typisch ist, hält sich Dvorák lange Zeit mit dieser Idee auf, indem er sie mit stimmungsvollen Gegenmelodien betont. In der Coda schafft die grandioso ausgeführte Kombination der beiden Hauptthemen einen prunkvollen Höhepunkt. Das Andantino ist eine Folge von Variationen über eine ernste Melodie in h-Moll, wobei die Wahl der Tonart sicherlich dadurch bedingt ist, dass H-Dur im ersten Satz eine herausragende Rolle gespielt hat. Die fünf Variationen zeichnen sich durch eine einfallsreiche strukturelle Palette aus, von der Kargheit der ersten über die duftige Zartheit der dritten, in der das Thema umgekehrt wird, bis hin zur den üppigen Klangfarben der vierten, die frei und lyrisch erblühend in die entlegene Tonart Es-Dur übergeht. Dvorák gewinnt in der Coda mit ihren ergreifenden chromatischen Harmonien und ihrem qualvollen Schlusspunkt seinem Thema eine unerwartete Eindringlichkeit ab. Im Gegensatz zu Dvoráks üblichem Verfahren in seinen Kammermusikwerken gibt es hier kein eigenständiges Scherzo. Statt dessen verknüpft er auf geniale Art Merkmale sowohl des Scherzos als auch des Finales zu einem einzigen Satz. Das Scherzo-Element ist im anfänglich erklingenden Walzerthema und einer späteren Passage in schnellerem Tempo enthalten, deren schneidende Gegenrhythmen an den Furiant denken lassen, einen tschechischen Tanz, der in Dvoráks späteren Werken häufig in Erscheinung tritt. Diese beiden Abschnitte wechseln mit einem Allegro agitato im Vierertakt ab, dessen glatte, sangliche, von der Stimmung her an Mendelssohn erinnernde Linienführung den Erwartungen von Dvoráks Tempoangaben nicht so recht entspricht. Die in der Coda erfolgende Verwandlung dieses überschwenglichen Lyrismus in eine kurzatmige Gigue wirkt in ihrer Komik regelrecht absurd. Als Dvorák sein Klavierquartett in Es-Dur komponierte, war er längst international berühmt und wurde von den deutschen und englischen Musikinstitutionen gefeiert. Der Berliner Verleger Simrock, der an der ersten Folge der Slawischen Tänze ein Vermögen verdient hatte, hatte Dvorák schon 1885 um ein neues Klavierquartett gebeten, möglicherweise angeregt durch den Erfolg, den Brahms’ Werk für die gleiche Besetzung gehabt hatte. Dvorák fand jedoch erst vier Jahre später nach Fertigstellung seiner Oper Der Jakobiner die Zeit, mit der Arbeit am Quartett zu beginnen. Es entstand im Juli und August 1889 kurz vor der Achten Sinfonie und scheint ihm leicht von der Hand gegangen zu sein: Die Melodien seien ihm einfach zugeflossen, schrieb er an seinen Freund Alois Göbl. Wie das D-Dur-Quartett wurde auch dieses bei einem von der Prager Künstlervereinigung finanzierten Konzert uraufgeführt, und zwar am 23. November 1890. Das Klavierquartett in Es-Dur ist ein komplexeres, anspruchsvolleres Werk als das in D-Dur, seine Gestaltung straffer, seine Instrumentierung origineller und einfallsreicher. Obwohl die Streicherführung des früheren Werks meisterhaft ist (Dvorák war ein fähiger Geiger und Bratschist), neigt das Klavier darin zu abgedroschenen Figurationen. Dagegen war Dvorák 1889 ein wesentlich erfahrenerer Komponist, und sein Klaviersatz im Es-Dur-Quartett ist insofern erheblich sicherer, als er sowohl die rhythmischen Möglichkeiten als auch die üppigen Klangeigenschaften des Klaviers ausnutzt. Eine Besonderheit des Streichersatzes ist die Bedeutung, die darin Dvoráks Lieblingsinstrument, der Bratsche, beigemessen wird, vor allem im jeweiligen temperamentvollen Seitenthema der Ecksätze. Die bemerkenswerte Einleitung des Allegro con fuoco ruft sogleich eine ausgelassene Erwiderung des Klaviers in der entlegenen Tonart b-Moll hervor und lässt gleich zu Anfang sowohl die raschen Stimmungswechsel des Satzes als auch seine breite tonale Palette erkennen. Dvorák gewinnt diesem einleitenden Abschnitt erstaunlich vielfältige Bedeutung ab, insbesondere in den unzähligen rhythmischen Wandlungen der Durchführung und in seiner spukhaften Wiederkehr auf tremolando gespielter Geige und Bratsche in der Coda. Die Tonartstruktur dieses Allegros ist besonders raffiniert und überzeugend: Das anfängliche Liebäugeln des Klaviers mit b-Moll zum Beispiel hat gewichtige Konsequenzen, wenn die Reprise das einleitende Unisonomotiv nachdrücklich in dieser Tonart und nicht im erwarteten Es-Dur vorträgt. Und das dissonante H ohne Vorzeichen, das dem einleitenden Motiv einen so unverkennbaren Beigeschmack verleiht, ist der erste Hinweis auf die Bedeutung von H-Dur und h-Moll sowohl für den ersten Satz (wie zum Beispiel in der Reprise des Seitenthemas in H-Dur) als auch für das Werk insgesamt. Im Lento geht Dvorák zur Tonart Ges-Dur über, und die Streichinstrumente nehmen einen leicht verhüllten, dunklen Klang an. Von der Form her ist der Satz so schlicht wie das Allegro con fuoco komplex war: Fünf verschiedene Melodien, von denen die dritte und letzte nahe verwandt sind, entfalten sich ausführlich und werden dann mit geänderter Instrumentierung in der ursprünglichen Reihenfolge rekapituliert. Vom Ausdruck her schweift die Musik jedoch weit umher, von der stillen Tiefe des einleitenden Austauschs zwischen Cello und Klavier bis hin zum kraftvoll instrumentierten vierten Thema, dessen leidenschaftliche Aufgewühltheit an den Mittelteil des Adagios von Schuberts Streichquintett erinnert. Im Geiste ist der faszinierende dritte Satz mit seiner herrlich luftigen Struktur irgendwo zwischen Ländler und Walzer angesiedelt. Ein Hauch Zigeunermelancholie umspielt das zweite Thema in g-Moll, das sich trübselig in engem Tonumfang windet, und die dritte Rückkehr des Hauptthemas im höchsten Klavierregister lässt, wie Dvoráks Biograph John Clapham festgestellt hat, an das Cimbalom denken, ein Instrument, das für tschechische Bauernkapellen typisch ist. Im gekonnt kanonisch gesetzten Mittelteil steht die raunende Eröffnung in H-Dur in verblüffendem Kontrast zur fortissimo gespielten Fortspinnung in h-Moll, in der Gegenrhythmen der Musik zusätzliche Schärfe verleihen. Ein letzter Anklang an Zigeunermusik taucht zu Beginn des Finales auf, das, ungewöhnlich für ein Werk in einer Durtonart, in es-Moll einsetzt. Dvorák geht typisch verschwenderisch mit seinen Themen der zweiten Tongruppe um. Zu dieser Gruppe gehört eine wirkungsvolle Verwandlung des Eröffnungsthemas, dolce von Cello und Geige gegen einen ausdrucksvollen Kontrapunkt der Bratsche gesetzt, und das aufbrausende H-Dur-Thema, das die Bratsche in ihrem sehnsüchtig klingenden oberen Register vorträgt, ist eine der schönsten Eingebungen des Komponisten. Die spannende, straff angelegte Durchführung konzentriert sich fast ausschließlich auf die einleitende Idee und verstärkt nacheinander ihren brüsken und ihren latent lyrischen Charakter.